Lake St Pardoux in France to Roses in Spain. Miles 145 from Villandry to Lake St Pardoux near Razes. Well, at least the weather cooperated today and the normal sunny service was resumed, but as for getting to our planned destination - we didn't really have a hope in hell!! If you read my last post you'll know that we were aiming for Rocamadour which is a vertical village that is home to numerous religious buildings that have been built into the cliff side on successive levels resulting in it clinging to the rocks high above a canyon through which the River Alzou flows. It lies in south central France and to get there our journey would have been about 240 miles - but the Gillet Jaune (yellow high vis vest) protesters delayed us long enough for us to abandon our original plan. We mistakenly thought all the blockades would have been done with today but we'd only travelled for about an hour before we met some protesters who were blocking the road in a town called Loches. They all seemed a very friendly crew, but first they barred our way by standing on a zebra crossing while munching their croissants, and then a little further on at a roundabout, they completely blocked our exit resulting in us having to take a short detour through the town centre. We later read that over 400 people had been injured, 300 protesters had been questioned by police and 157 were taken into custody! It seems that about 150 sites around the country were still being blockaded and that riot like troubles had developed in some places resulting in human injuries and damage to property. And things didn't get any better for us because when we reached the A20 the protesters had slowed the traffic to a crawl for many many miles and this resulted in us only having covered about 80 miles in the first two and half hours of our journey. Therefore, because we thought we might meet further problems if we continued, we changed our destination to the much closer Lake St Pardoux near Razes which is another of our previous haunts, and we'll have another shot at getting to Rocamadour tomorrow. Now, having said all of the above, I just want to add that our sympathies lie with the French people who are protesting, about the 22% hike in fuel prices (with more increases planned for next year) because that would be a bitter pill to swallow for anybody, but at the end of the day, we couldn't really comprehend how the happenings over the weekend would help or influence better outcomes! So, with our changed plan we arrived at Lake St Pardoux in the early afternoon, and found that the Aire had been moved to a much better location further along the lake side. It's still free and much bigger now, so as we only had one or two neighbours we had plenty of choice to pick out an ideal parking spot! And we thought we had - but as we're under trees there are 'things' bouncing on our roof😕 - maybe the squirrels are retaliating because we've invaded their peaceful space! Anyway, we decided to ignore that issue and we were soon out strolling by the lake and admiring this beautiful place that is presently painted in lots of very pretty autumnal colours. 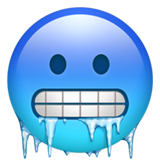 Brrrrrrrrr, to say the least - it was a bit cold this morning and when we peered out of our windows it was to see the frost lying 'deep and crisp and even' over the woodland floor!! But 'HOORAY' we finally made it to our planned destination and without any more holdups, and in so doing we passed through more of the lovely Dordogne Valley which lies between the Loire Valley and the Pyrenees mountains. Our journey initially took us along a section of free motorway, and then up hill and down dale along windy roads that led us through several very pretty villages, and out into the countryside where our way was lined with multi hued trees and fruit orchards. We arrived at Rocamadour around 12.30 and we very nearly decided to treat ourselves to lunch out - but it was a good job we didn't because nearly every eating venue in the village seemed to be closed for winter!! So having fortified ourselves with nourishing cheesy beans on toast we ventured out for our exploration of this vertiguous village that is said to be one of the most visited destinations in France - but that wasn't the case today - we had much of it almost entirely to ourselves! The layout of the village is (from top to bottom) the Rocamadour Chateaux, then the sanctuaries mid way down, and then the main pedestrianised village further down still. 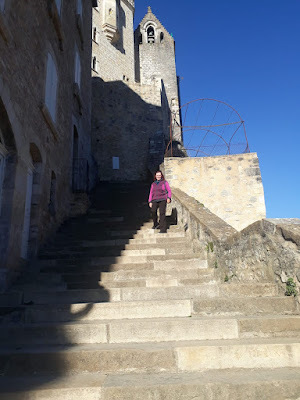 Therefore, our exploration started at the Chateaux but we decided against paying for the brief walk around the ramparts which tower over the village below. Instead we walked down the Chemin de Croix which is a tree lined multi hair-pinned (15 in all) path that has the Stations of the Cross on each bend, and also a grotto about half way down. At the bottom of the footpath we arrived at the religious centre and entered the inner sanctum area via a gated portal and a long ancient tunnel. This popped us out into a little courtyard around which 8 churches and chapels are clustered beneath the cliff face, and it is also from here that the long steep steps of the Grand Escalier start (233 of the them) and these eventually led us down to the village. The main village of Rocamadour lies along one pedestrianised street and it's very pretty with lots of old stone houses, boutiques, eateries and arched stone gateways at each end. However, nearly everything was locked up tight for winter, so other than admiring the ancient architecture and the views over the gorge there wasn't much to do. Therefore, once we'd traversed along the street from one end to the other we started our climb back up to the Sanctuary area, and paused there to view The Basilique St Sauveur which is the largest of the churches and has one of it's walls made up of the cliff face. We also visited the Chapelle Notre Dame where the Black Madonna resides on the alter - she is a slim elongated silhouette of black wood that is thought to have been carved in the 11th century! Once we'd climbed back up to the level of the Chateaux we completed today's tour by pottering along to the village of L'Hospitalet where there are more religious buildings and also views back towards the entirety of Rocamadour. And it was from this vantage point that we could fully appreciate the beauty and the balancing act of this lovely place. Once back in T4rdis2 we settled down and enjoyed the warm sun's rays that our windscreen had enhanced so that our inside temperature was a sauna like 22 degrees! But that didn't last long, and as the skies darkened the chill started to creep in so another very chilly night, accompanied by regular church 🔔🔔🔔 was enjoyed!! We Left the 'Grand Site' of Rocamadour around 10am and started on what we thought was to be a 144 mile journey towards the town of Castelnaudary, but once again things didn't quite work out as planned! Initially we found ourselves travelling along steep narrow roads that almost resembled some of those that we'd passed along in the Alps - therefore progress was slow especially when the risk of icy corners was thrown into the mix! Luckily, this only lasted for about the first 20 miles, and in all that distance we only saw 2 other cars travelling in the opposite direction, so having the road to ourselves helped. Then once we were tipped out onto a proper road we thought our rate of travel would increase - that was until we met more 'Gillet Jaune' protesters who were blockading 2 roundabouts in the town of Cahors! It seems that Saturday's one day fuel protest has escalated into something that might last all week, so therefore, after a fairly long delay, and the risk of more around Toulouse, we decided to change our tack and use the toll motorways instead. This reduced our journey distance by about 20 miles and also allowed us to avoid a lot of frustrated drivers who seemed a bit fed up of sitting on roads that had become car parks! The 3 lots of tolls that we encountered only cost about 16 quid, and all along the length of the motorway it was fast plain sailing - that is until we departed from it very near to what should have been our final destination at Castelnaudary! There we found yet another blockade which we sat in for about half an hour without moving at all 😠😠, and by that time my dear husband had lost his patients with the situation so he spun us round on a sixpence and took us off to a free Aire about 15 miles away at Fanjeaux! And this action had additional benefits because if we'd stayed at Castelnaudary we'd have had to come back to the same roundabout which almost certainly would still have been blockaded in the morning. Mileage 138 from Fanjeaux in France to Roses in Spain. This morning we left the countryside Aire at Fanjeaux and headed back towards the A61 toll road, while keeping everything crossed 🤞🤞that we wouldn't meet anymore 'Gillet Jaune' blocking our way before we got there. Over our coffee this morning we'd read how the protest had de-escalated today with numbers dropping from 300,000 last Saturday to only 10,000 today, but despite that, things had become quite ugly in some places with more arrests, more damage to property and more human injuries occurring. Additionally, the prediction is that the weekend will see numbers of Gillet Jaune magnify hugely again, so all in all at this time, we're very keen to get out of France! Happily for us there were no more holdups, but we did get a bit worried as we approached our exit point on the A61 which was just before the Spanish border. There we found a mile and a half long 2 lane queue of lorries which were once more suffering from a blockade at the toll booths. However, the outside lane was empty so we were able to sail past them all, and when we reached the dreaded yellow jackets they did us a huge favour 😃😃! They waved us through the open barriers and we didn't have to pay a penny despite the fact that we'd travelled for about 100 miles along the motorway. Then very soon after that it was '👋HOLA👋' to Spain as we crossed the border, and there we did have to pay a toll - it was just 45 cents 😂 - so nothing that would break the bank! But one of the things that did catch our immediate attention was the fuel prices - the Spanish ones were about 30 cents cheaper - so for us that would make a fill up about £14 less than in France - I'm glad we went over with a nearly empty fuel tank! At this point, rather than continuing along the Spanish toll roads we diverted onto the very acceptable free main roads and continued on our way to the town of Roses (where we've stayed on several previous occasions). Once there we stopped off at Lidl to do a bit of shopping and then dived into the new camping car Aire which is just a few mins walk from the lovely pedestrianised sea front, so after bacon and egg butties we enjoyed our first Spanish Promenade in the very warm afternoon sunshine.